A man walks, another follows. One man carries with him his faith, the other carries nothing. Shadow and light, earth and water. 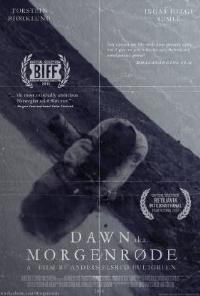 To talk about Dawn is like speaking about a dream, the film is almost ephemeral, a science fiction film stripped back to almost nothing. It is suggestion and nuance and during its 70 minutes it shows us little, but hints at a lot. Filmed in virtual monochrome in Iceland, the film depicts a journey, and the film is also a journey through the jagged black landscape jutting out in front of a bone-white washed out sky. To reveal the destination would be to take away the meaning. So here I am writing in riddles, how does someone describe a fever or vision? If the latest Mad Max film (review) was also a journey, a glorious, frenetic, maximalist journey, this is almost the anti-Mad Max, it's more of a meditation exercise than a sci-fi film as we know it in 2015, and it's as necessary and as welcome as Mad Max: Fury Road. Whilst mainstream sci-fi has become about the spectacle, the underground, perhaps, must push the other way, it seems fitting and maybe it's logical that it does. Recently there has been a bit of a resurgence in films where "not really much" happens: The Rover (review), Valhalla Rising (review) and Under The Skin are all relations to Dawn in a sense, but the events of this film are probably more akin to the hypnotic to and fro of a clock pendulum than those films, even if they are stylistically similar. Dawn lulls the viewer into a sort of theta state, like the monotone chanting of Buddhist monks, and whilst I did not reach nirvana, the film did something to me. Whilst at points it annoyed me, it never bored me. This is impressive when you consider the amount of flash-bang that Hollywood throws at the screen in an attempt to entertain and is a testament to the meditative qualities of the movie. Age of Ultron it is not. In the end did I like it? I thought I didn't, then I slept on it and now I think I do. Do I understand it? Probably not, Am I meant to? I don't know. Would I recommend the readers of this site to watch it? Well, that is for them to decide. The film begins with a quote from the Bhagavad Gita, and I will end with a quote from Ferris Bueller, perhaps it will make some sense even if the source is far more mundane: "Life moves pretty fast. If you don't stop and look around once in a while, you could miss it." You spelled the title of the movie wrong in the headline.